Everyone loves a friendly competition, right? Bright lights, cameras, judges. Big money prizes! What makes it all even better is if the talent is home-grown. Saint Louis Fashion Week has extended its season this year, stretching out across several weeks of haute happenings, shows, and events. 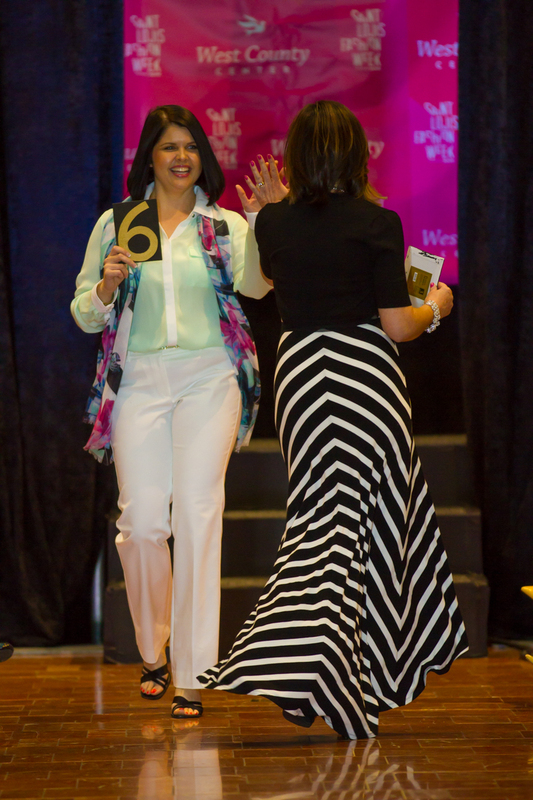 The 2016 season's biggest bang is the Caleres Fashion Entrepreneur Competition, which gives five local makers the opportunity to compete to win the grand prize of $10,000, second prize of $5,000, and a People's Choice award. Intrigued? Learn more below, and enter to win two tickets for the event on November 10th! Not only will you find five of Saint Louis' most talented and up-and-coming names showcasing their work, you'll also be treated to interactive fashion and video presentations, designs inspired by Caleres' shoes, and in true Shark Tank-style, live pitches from the competitors. Something I always yearn for when peeping a fashion show is more insight into what makes the designer tick, and here's my (and yours!) chance to hear from creators first-hand about their processes. The panel of "judges" for this event even includes Eric Johnson, Executive Director of Saint Louis Fashion Fund - you might have heard that the Fashion Fund had its official launch this week! I'm excited to not only be there in support of our city's talented folk and learn more about how the Fashion Fund is supporting funding, mentorship, education and professional development to fashion design entrepreneurs in St. Louis, but also in a music capacity - I'll be DJing for the cocktail hour and party aspect. Every gig is a chance to learn more about an industry, and this is already one I love! It should come as no surprise that the finalist that might immediately pique my interest would have a strong focus on footwear! Claire Flowers is named directly after its designer, who resides here in Saint Louis. Intent on having shoe that fused fashion and function, she opted to design her own. Feminine silhouettes with a heel that flares out at the base have helped the brand of Claire Flowers excel - you can snap up a pair of these beauties in several local shops, like 10Denza & Ivy Hill, as well as a few national stores in states such as New York, Kentucky, and Illinois. One of my favorite little features about Claire Flowers' new approach to crafting a comfortable shoe is the material used in the heel cap: TPU, the same material roller skates are made out of! I grew up roller blading and always thought the wheels were pretty neat - sturdy, yet with some give in order to take force. Sounds like the perfect heel cap to me! I can't wait to hear more from Ms. Flowers herself at the event, and see more of her work in person. If you're interested in joining me on November 10th at the fabulous Majorette on Manchester Avenue, you have two options! 1) Get Lucky! Head on over to my Instagram profile for a chance to win 2 tickets! 2) Head on over HERE and use code CALERESFECSOSM in the referral box - that way we can know how you heard about the event! The shroud around many mental disorders has been becoming more transparent as doctors, researchers, and science help to explain what makes the human body tick. One that happens to be the most deadly also happens to be the one that no one wants to talk about. An eating disorder is not simply caused by an individual's string of choices, but also by genetic markers. I'm teaming up with the Missouri Eating Disorders Council to help open the dialog addressing the myths and facts that surround eating disorders. With only about 1 in 10 people living with an eating disorder on average actually seeking treatment, it's definitely worth talking about. About 30 million people in our country alone are diagnosed with an eating disorder, and over a half million of those live in Missouri. That's nearly 10% of our state's population! This past Friday, I joined other Midwest Influencer Network bloggers and our out-of-town blogger guests to meet with members of the MOEDC and learn more about their campaign. A cocktail hour at Central Table started off the evening, with Ann of Stealth Creative introducing herself and interviewing bloggers on video about their opinions/knowledge of eating disorders. We then sat down together and heard from MOEDC's Annie Seal, a local mother who nearly lost her daughter to an eating disorder.. Her experience was eye-opening and introduced us to some of the myths that persist in society about eating disorders. Over an amazing meal served by Central Table, we also heard from local swimwear designer Lori Coulter, who seeks to create bathing suits for all bodies, as well as the personal story of a strong woman who has battled an eating disorder. The illness comes in all shapes and sizes, just as we do. Being in the fashion industry, bloggers have an insider's view and usually some pretty strong opinions on how body-based issues and insecurities. It's no secret that the fashion industry is built around the lithe, slender female body, and typically excludes people of varying sizes. Is that what is ideal? How much of an impact does a constant barrage of a thin frame have on young, impressionable minds? How can the fashion industry change to reflect a more healthy image rather than just a small size? All these questions and more came up at Central Table. My personal experience with how the fashion and blogging world handles body ideals is intimate and strong. A previous job of mine dealt with fashion models. They would have their measurements taken multiple times a year, often with critiques on gained inches or some body part that had gone too soft. The modeling agency wasn't even what I would consider a tough one, but I knew what was at stake for these young women and men. When it came to blogging for me, I spent a while debating whether or not to even start a blog. I didn't fit the beauty standards, my thighs are too round, my hair too weird, my taste in clothing too low-class. I was worried I'd stick out like a sore size 6 thumb, but I went for it anyway! Of course, I haven't had any issues surrounding my size, but I am forever aware of how my body looks in images. I don't believe that I am "photogenic," I just have learned how to position myself in ways I find most flattering in images. See? It's all a mirage! Both the fashion industry with its Photoshop and bloggers with our sneaky poses. Goals? False! It's all an illusion that creates unattainable ideals that can be detrimental to a young person's mental health. So, I hereby have formally joined the conversation on eating disorders! I vow to raise awareness, open safe and informative dialogue with others when necessary, and help to educate those who may not know what is myth and what is fact. I will strive to promote a healthy lifestyle, and try to inspire other to make conscious decisions to support their own healthy choices as well. I would love for you to join the conversation! Everyone knows someone who is affected by an eating disorder, whether you know it or not. Educate yourself so that you can be there when someone might need a friend or support. Learn more about myths, find resources, and also catch up on treatment options in case you might need it yourself. Selfie and adjacent shot by yours truly. Thank you to the MOEDC for inviting me to be a part of this campaign and for hosting the lovely dinner last week. This post is also sponsored by Explore St. Louis and the Midwest Influencer Network, but all opinions, support, and enthusiasm are my own. 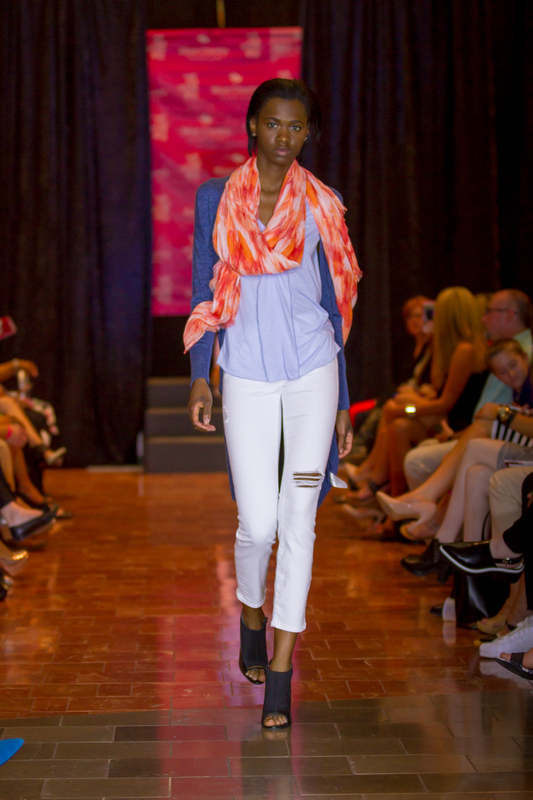 Last Thursday, the second day of STLFW offered fun, fashion, and friends. A private dinner hosted by Collections by Joya brought STLFW bloggers to Element in Lafayette Square. A company run by women for women, Collections by Joya supports artisan crafters - specifically women! The items are hand-crafted and gorgeous, and I was thrilled to be gifted a delicate and long necklace with the sweetest little tassel! You can see it in the picture down below of me with model Sierra Williams. The food by Element's chef was outstanding, and the steak dish reminded me why I love, well, steak! We all then rushed off to the Luminary on Cherokee Street to catch the final moments of the STLFW Wear It: Fashion Challenge. Local designers Michael Drummond, Nina Ganci, AJ Thouvenot, Nasheli Ortiz, Qun Liu, Destini Gamble, Barbara Bultman, Alexis Cook, Leah Babette and Tiffany Rae were tasked with creating a piece inspired by a work of art. Nasheli Ortiz, was inspired by Sarah Frost’s Built, and her piece took home the $5,000 prize. 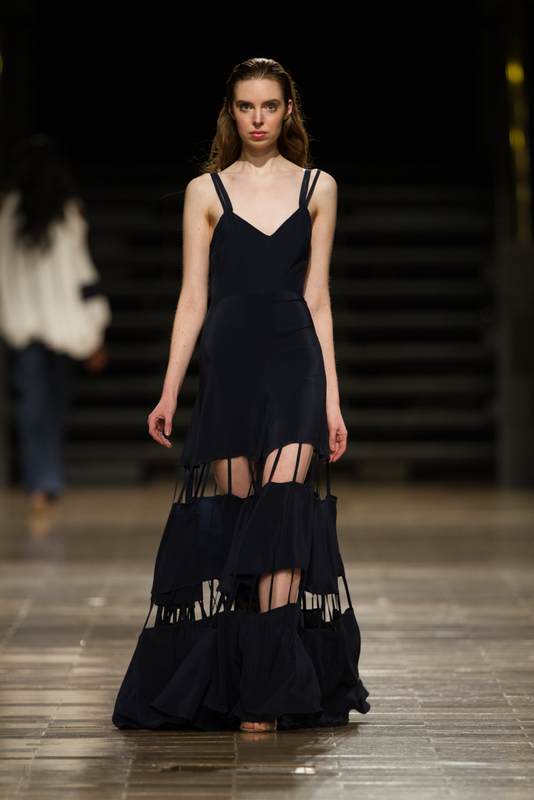 My personal favorite was designer Destini Gamble's piece based on Pablo Picasso's painting The Peasants. The white jumpsuit was just too gorgeous! I caught up for a second with model Sierra Williams because I used to see her around the office during my time working for Centro Models. She was wearing Alexis Cook's piece, which was based on the glass artist Dale Chihuly's work. I'd recognize a Chihuly-inspired piece anywhere! After mingling for just a bit more, I headed home. The downpour that had kicked up outside was enough to put me directly into my PJs and onto the couch. Stay tuned for more from STLFW on the blog soon, and thanks for reading my adventures! Many thanks go to ALIVE Magazine and Midwest Influencer Network for inviting me to be a part of the awesome experience that is STLFW. 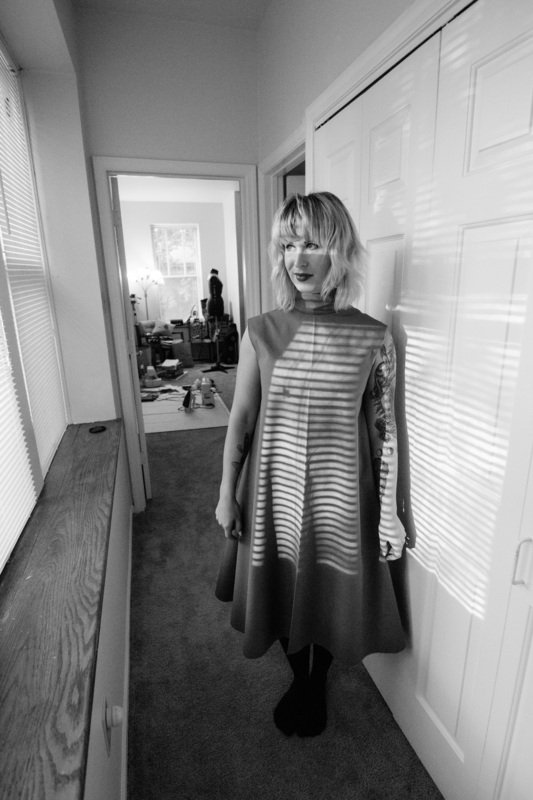 When I first met designer Ryan Moore, I was running around, haphazardly dressed and perfectly panicked in the bowels of the Boo Cat Club. It was the day of Pins & Needles, the annual local designer challenge put on by Brainchild Events. We ended up speaking about his music selection during the hours before the show, and we clicked over his choice of Glitch Mob. I was able to mix in a song of my own suggestion to his pick, and thus our collaboration friendship was born! 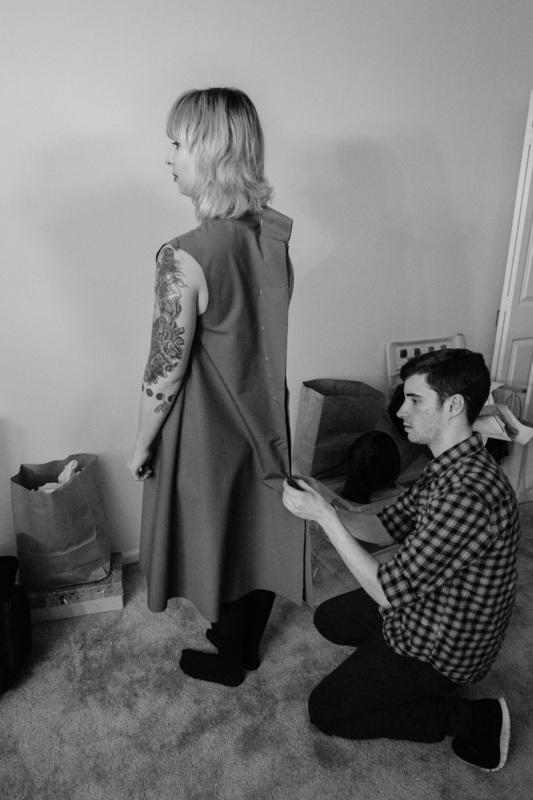 I had already decided to have something custom-made this year for Saint Louis Fashion Week, and Ryan seemed like just the person to do it. 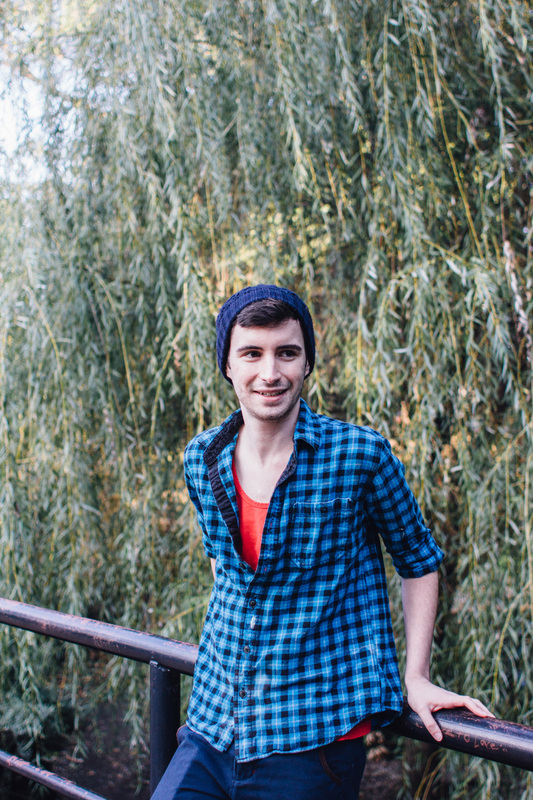 We met initially over coffee, chatted about my vision, and went from there! I stopped by one day a few weeks ago to check out the progress, get a final fitting completely, and see where all the magic happens. Ryan loves working with leather, and he allowed me to borrow a few of his pieces to take to NYFW with me! See this snapshot here of a handbag he stained and painted, as well as a stunning cuff he crafted. Above, he demonstrated how he softens and thins leather to make it more supple and wearable. I donned my muslin, or mock-up, and Ryan checked the fit. A few trims here, a couple tweaks there, and voila! We were in business. He made the mock-up of a denim material so that it had weight and would lay more like the final piece, which is made of silk. Instead of a solid color, Ryan and I had agreed on a paint splatter pattern, done by hand, to make the piece truly one of a kind. I picked up the final piece on Monday night, and it fits like a dream. Here's a quick shot of it in action last night at the first night of STLFW, complete with a leather bag and leather/rabbit fur cuff also by Ryan. Stay tuned for better images of the dress soon! Black and white photos by Abby Gillardi. Runway snapshot graciously taken by Yasmin of Bangles & Bungalows. This past Thursday, I had the pleasure of sitting front row at Saint Louis Fashion Week's Spring Style Soiree! This super fun event was held inside West County Center, and although I know that some of STLFW's events have been held within malls before, I have not yet had the chance to attend one until now. What a fun experience - the hustle and bustle of passerby shoppers and the sparkle and dazzle of a true yet miniature runway! Co-hosted by the babeliest of all blogger babes, Angie of Honey & Denim (pictured above), the evening had a bubbly yet classic STLFW feeling that left me excited not only about spring fashion, but the still-expanding legacy of our very own city's Fashion Week. The Soiree event not only featured your traditional runway models, but also some incredibly fabulous, strong, and amazing women. Because STLFW teamed up with Siteman Cancer Center for this night, the opening presentation of White House | Black Market was walked by a group of cancer survivors. 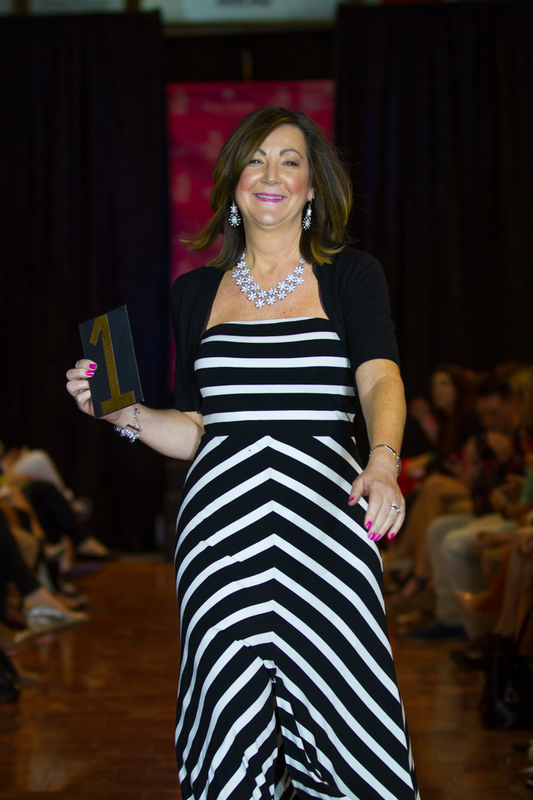 These women proudly strutted down the runway, holding cards with a very special number on them - each card represented the number of years its holder has been cancer-free. As ALIVE Magazine's resident DJ and fellow blogger babe DJ TrashTalk started up the music again, threads and trends from various stores within West County Center strutted down the runway. I'll run through each shop highlighted and showcase a couple of my favorite looks from each! The Limited's presentation focused on a balance between classic springtime brights/pastels, and more classic workwear with darker hues. It's coincidental that both of my favorite looks were worn by two young ladies that have modeled for Centro Models, which is a division of TalentPlus, where I work! Ann Taylor brought out both classic and some edge with its presented looks. Although the top left look is a little too "suburban mom" for me, if we changed the pants to black and maybe threw on some funky jewelry, I'd rock it. And I'll take the whole top right outfit, done and done! Altar'd State brought out a festival-friendly, boho-vibe. The top left dress, with its chiffon underlayer and Chucks as accessories, caught my attention. The right outfit is something I'd wear, because I'm so skeptical of the ever-popular uber-short dresses. Throw some jeans underneath and some strappy sandals, and you're good! Banana Republic brought the heat with its sassy editions of classics. 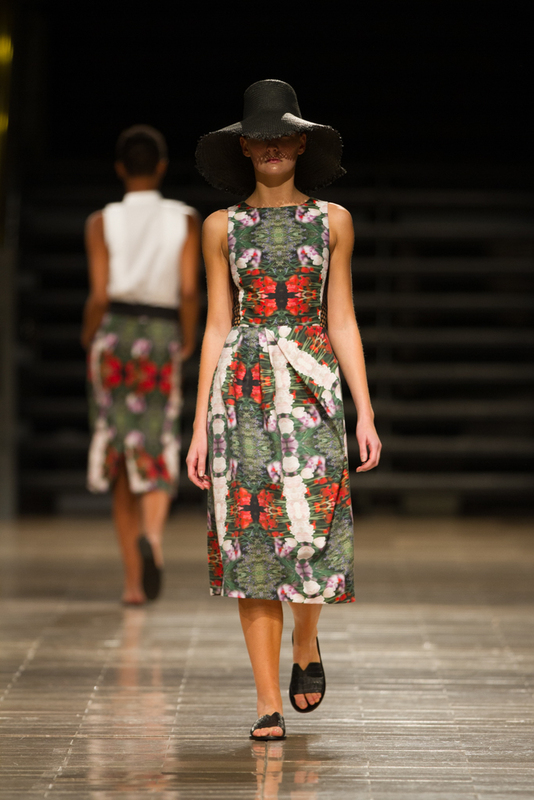 The skin-tight midi dress, paired with current mules and a low straw hat, felt very lifestyle-friendly. Cocktails? Check. Brunch with your babes? Check. The floaty trapeze number that closed the presentation really was tempting me! I can see wearing that beauty all the time, with a lacy bralette and a long pendant. Gap's looks were very, well, Gap, featuring looks that kept to its recent campaign of championing being "normal." Basic, clean outfits called to my casual side, and the slouchy denim on the right definitely needs to get in my closet. With labeled name brands, spunky prints and youthful feel, Macy's kept my attention from the men's looks to women's looks. The simple yet vibrant dress and bold jumpsuit are not necessarily something I'd wear, but are looks that I know will be crowd-pleasers during upcoming warmer months. Although I rarely set foot in Nordstrom, I'll definitely be checking their clothing out more after their presentation. I really must have that black layered dress, and I'm pretty into that funky tropical-inspired print on the men's shirt. After the presentations, attendees mingled, and a few of us opted to pop into the Foundrie's shop, where Jenni of ISPYDIY had set up a DIY project for everyone to try. I snapped a few photos of Carylee of More Pieces of Me working on the project - stamping your very own leather bracelet to keep. Other attendees took advantages of the night's super special discounts offered by the shops involved in the show, but I was a good girl and didn't spend the $150 on that black Banana Republic dress... sigh. I followed my friend Lindsay of Heartland Underdog and a number of friends and new acquaintances to Planter's House in Lafayette Square for after-event drinks and snacks, where I was able to chat with Jenni a little about her stay in Saint Louis. We tried to convince her that Saint Louis has so much more to offer than you can explore in just a few days, and we hope to have her back again soon. I had such a wonderful time getting to enjoy the Soiree with friends both new and old. I look forward to all of the year's upcoming STLFW events, and can't wait to see what they bring!